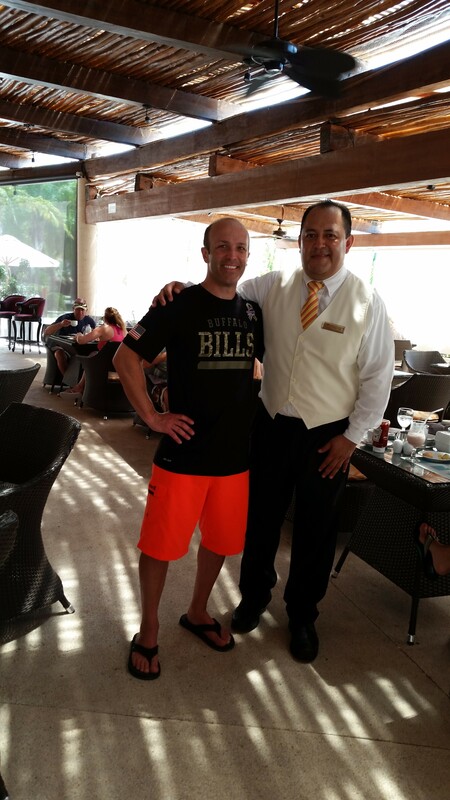 On a recent trip to Cancun, Mexico, I was approached by Nep Grande, a Bills fan who got hooked on the early 90’s teams and stayed true as a fan through a lot of the recent lean years. He works at the resort where my wife and I were vacationing. Wearing a Bills shirt kind of gave me away, but he recognized me from Buffalobills.com. After showing me some of his photos with Hall of Famer Bruce Smith, who he met a few years ago, he asked for a photo with me. I asked him if he had been to a Bills game before, perhaps at Arizona or Dallas. His answer? Sounds like a legit fan to me. Fortunately he’s got a friend who is a Bills fan in Buffalo, so he’s hoping to make it to a game in the next year or two. Here’s a shot of Nep and I in Cancun. Bills Nation alive and well south of the border!